My partner Kellie keeps bees—a lot of them. Actually, she does more than keep them. She catches swarms, she cuts colonies out of walls and re-homes them into hives, and sometimes, when she gets a call about some honeybees living in a tree that the owner wants to cut down, Kellie drives on over with a chain saw, and comes home with four feet of the trunk—a ready-made beehive complete with a well-established colony. 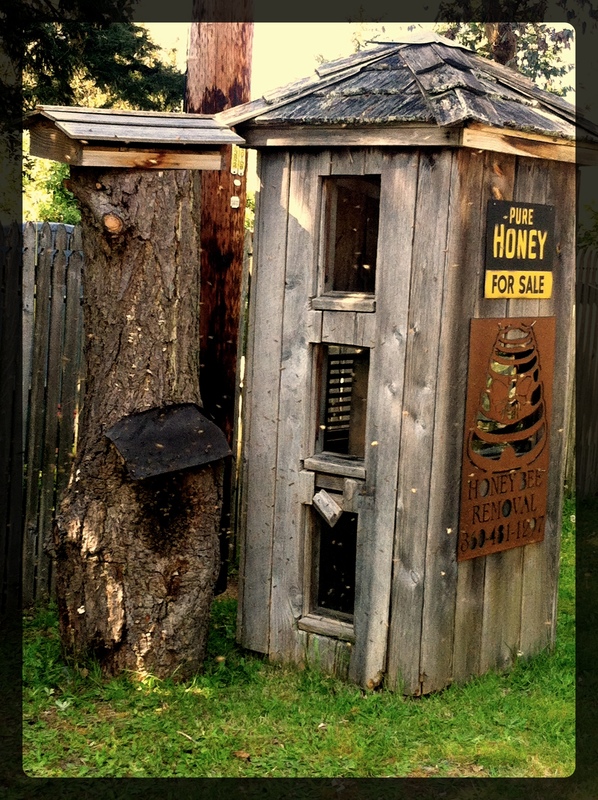 We’ve got three of these trunk-hives on our property, and I’ve often tried to convince Kellie that she could sell one or two of them for big money—I mean, who wouldn’t want their own bee log? Of course, there’s no way to maintain the trunk-dwelling colonies. You can’t put on a bee-suit, break into the hive and see how they’re doing. You just have to let them do their thing. Then, when a colony dies, they leave behind a ready-made honey-smelling home for the next swarm that comes along. Spring has come early in Olympia and for the last two weeks, whenever the sun comes out, Kellie’s phone starts ringing. 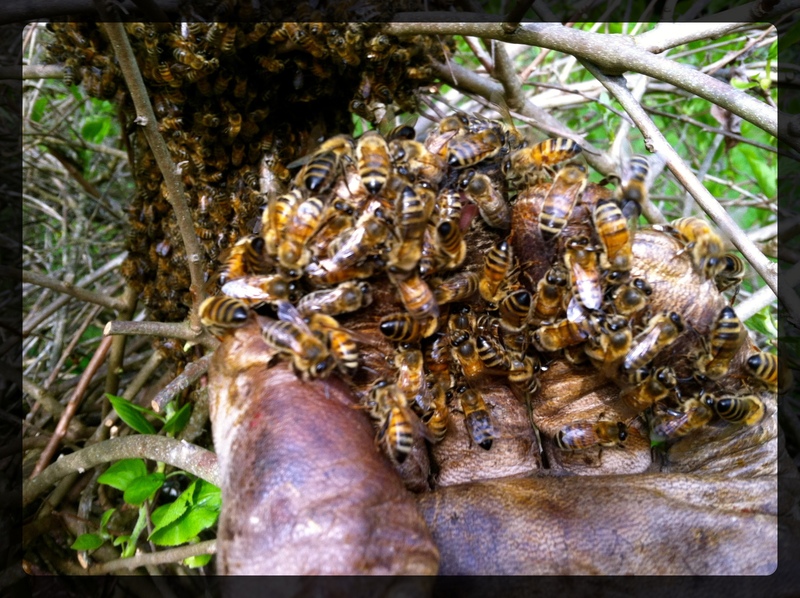 People call because they have swarm in their yard, or they want to borrow a frame of comb, or they can’t tell if their queen is laying. I’ve learned about bees by osmosis, from hearing Kellie on the phone and watching her suit up and go to work, but I’ve never handled the bees. Someone’s got to watch the kids, and even on the days when Kellie is capturing a swarm in our neighborhood, I have my hands full trying to keep Stump from running into the middle of the action. Over the years, my knowledge has expanded but my competence is limited. “Sure,” I said. Checking is easy. I’ve come to love the thrum and excitement of a swarm as they depart their former home, followed by their steady silence once they’ve clustered on a branch. “But what do you want me to do if that happens?” I was expecting that she would explain to me where the nearest bait box was, but she had a different idea. “Catch them,” she said, like it was the simplest thing in the world. I was as flattered by Kellie’s faith in me as I was bewildered by the suggestion that I would intuitively know how to guide a swarm of honeybees into a nuc box, and that I could do so with a toddler at my side. As it turned out, there was no swarm that afternoon, but her suggestion haunted me through the weekend, and every so often I asked her a question to clarify what she had envisioned for me. “So you really think I could do that?” I asked her. I kept thinking about an interview I’d read with Ann Patchett many years ago about her novel The Magician’s Assistant. She explained that her impulse for writing this book came from her observation that spouses gradually acquired the skills of their partners. Over time, we take on traits of the person we’ve married. We can channel them, imitate them, become them. I remembered this on Monday, when temperatures reached 72 degrees—swarm weather. I came home with Stump at lunchtime and put him down for a nap. The evening before, one of Kellie’s colonies had swarmed and gathered high in a fir tree, way up at the edge of our line of vision. She couldn’t catch it, but she’d been keeping an eye on the cluster, hoping the scout bees might discover one of her baited boxes. When I called her from home that afternoon, she asked me to go outside and see if they had moved. “Can’t say,” she said, and instructed me to look in all the nucs to see if they had settled into one of those. I reported back that they were empty. I was disappointed. I so badly wanted to be the one keeping things under control. Thousands of bees in flight. Can you see them? I was preparing myself to follow her instructions, to step into the role that she had imagined for me, the role where I wasn’t a bystander, but an apprentice, a fellow beekeeper. “What should I do?” I asked. Twenty minutes later, when Stump woke up from his nap, I took him outside to verify. 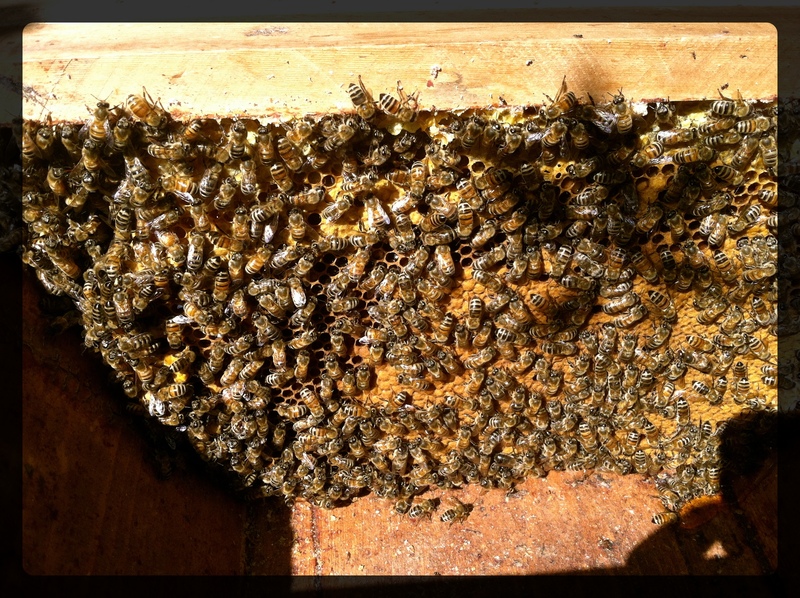 The bees had settled into their new home and now just a few of them buzzed back and forth from the entrance. I was half relieved that the bees hadn’t required my assistance, half disappointed that I’d been denied my chance to rise to the occasion. 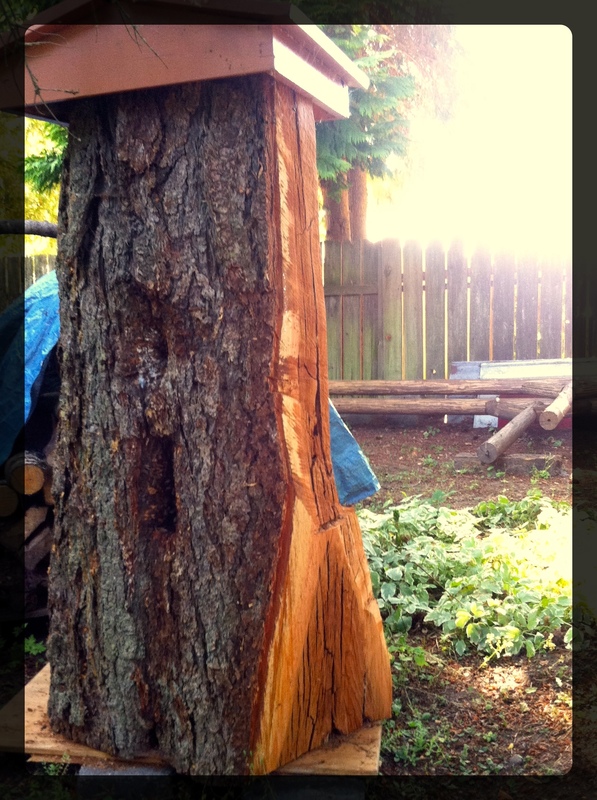 Later that same afternoon, after discovering yet another swarm in our cherry tree, I placed Stump on my hip and watched as Kellie tenderly scooped a handful of bees into the nuc box. Though dozens of annoyed bees darted past her face, the ones on her hand crawled quietly into the new home she had prepared for them. After repeating this three times, she climbed down the four-foot ladder, took off her gloves, and trusted that the rest of the colony would follow. Now that I’ve seen how it’s done, next time, I swear, I’ll be ready. So beautiful. “We can channel them, imitate them, become them…” How much do I love this writing? Thank you. I maybe ok with bees, but snakes and rodents I can’t hang with. I LOVED THIS BLOG. Can I get you a bee suit? 🙂 I should order some for the whole family. This was beautifully written. I absolutely love bees, and always have. It must be intimidating as you described but I do suppose that you have learnt a lot through observation (I myself have always learnt a lot of precise things through observation). I wish you luck for when you will get the chance/have to take care of swarming bees in the future, I do suppose the moment will come. Thank you. We are supposed to have warm weather again today, so maybe I’ll get my chance. you are welcome 🙂 I do wish you best of luck! This is gripping and fantastic! Such lively details in the writing; I can hear the buzzing.Terrific! What a great story. I loved imagining you with the bees.. and so cool that you live with them (I think it would take some getting used to… I’m a bit scared of bees, probably cuz I’m allergic to them. The whole time I was reading I kept wondering-but wait, are they gonna bite? Are they gonna bite?!). I totally see a novel written by you called The Beekeeper’s Wife in your future :). Gorgeous writing as always. 🙂 The funny thing is that I haven’t once been stung in the five years that Kellie’s kept bees, but she does get stung all the time–you know, because she’s right up in their business. How exciting! Made me miss you guys. I so enjoy your stories! This one reminded me of a PBS nature show called “Swarms.” Fascinating. It’s on Netflix. Thank you–I’ll check it out! Kellie will love that.